Home >Why Every Merchant Keeps Saying about Magento 1 to Magento 2 Migration? Why Every Merchant Keeps Saying about Magento 1 to Magento 2 Migration? Old as the topic seems to be, if your eyes end here, then you must be those being in two minds of whether to migrate Magento 1 to Magento 2. Update or Be Left Out? For the time being, you still sit back feeling every feature in Magento store works just enough. No need to modify! However, in the eCommerce world, you should think several years ahead. Technology, as well as customers’ demand, changes almost daily. If you fail to keep up with those updates, it is likely that sooner or later, your business will be left out. In this article, let’s go insight into three urgent questions for Magento to Magento 2 migration along with thoughtful answers. Magento 1 to Magento 2 migration is definitely not a several-day story. Any change needs the right time and the right plan. 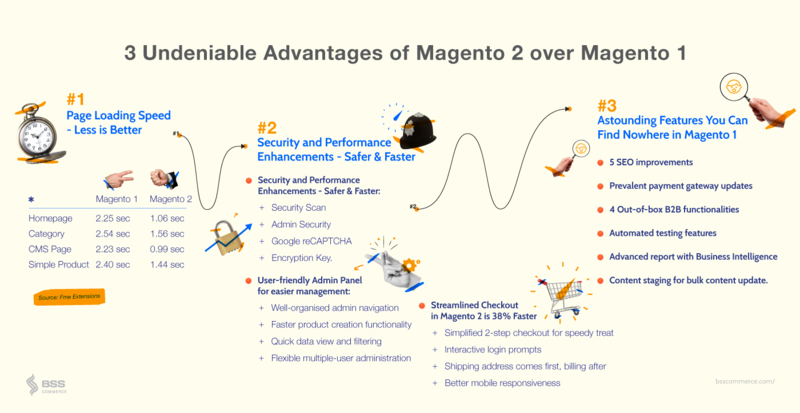 Since the official release of Magento 2 in 2005, Magento team keeps advising merchants to start the new or migrate Magento 1 to Magento 2 because of its faster performance, improved interface, and easier maintenance & updates. However, the company makes its commitment that Magento support will not come to an end shortly. That way, merchants have adequate time to prepare for Magento to Magento 2 transaction. Continue providing software support for Magento Commerce 1 through June 2020. Keep offering software security patches for Magento Open Source 1 through June 2020. The support varies from Magento 1 versions to versions, hence, please check carefully. #1: Why Is Magento 1 to Magento 2 Migration Inevitable? It is the first question coming across your mind when talking about Magento upgrade. 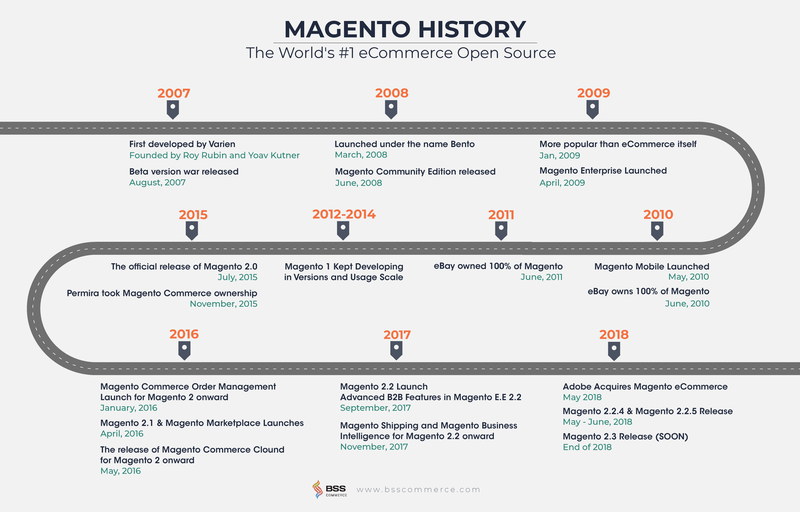 Many people just wonder if there Magento 1 stores still run smoothly and extensively, why bother changing to the much more complex Magento 2. Or, since Magento team has given their words to ongoing Magento 1 support, its end of life will not be anytime soon. So far, the Magento team has announced the Magento 1 end of life several times, both officially and unofficially. However, online merchants seem not ready yet, which results in the extended the support time through June 2020. It is also predicted that time, Magento team will completely stop supporting Magento 1 since online merchants will have been given enough time and preparation to migrate Magento 1 to Magento 2. In other words, there will be no longer Magento security patches, nor Magento connect. Hence, your Magento 1 stores will be vulnerable to hackers. Not to mention, the company has already stop develop and improve Magento 1 in features to invest all efforts in Magento 2 development. If Magento 1 still works fine and meets your current demand, sincerely congratulate! However, you must also several times feel daunting when it comes to Magento 1 features. For example, Magento 1 backend interface is unexpectedly complicated, making non-tech merchants hard to navigate and manage. In Magento 2, the Admin panel is more user-friendly. Even the ordinary merchants can have an overview of the page structure at the very first look. Do You Know All Wonderful Features in Magento 2? And, take a quick look at Magento 1 and Magento 2 highlight differences. Without a doubt, all efforts of Magento team have been invested in Magento 2. Hence, there are lots of the out-of-box Magento 2 features unable to be found anywhere in your Magento 1 versions. Such a shortage when customers’ demands are increasingly varied. Some might argue that Magento platform is fully extensible. Hence, merchants can deploy Magento 2 features right in Magento 1 by installing Magento extensions or hiring developers. It is absolutely true. However, now that Magento team are about to stop supporting Magento 1, extension developments also pay more attention to Magento 2 extensions rather than Magento 1 ones. What’s more, employing developers to do such tasks might cost much. 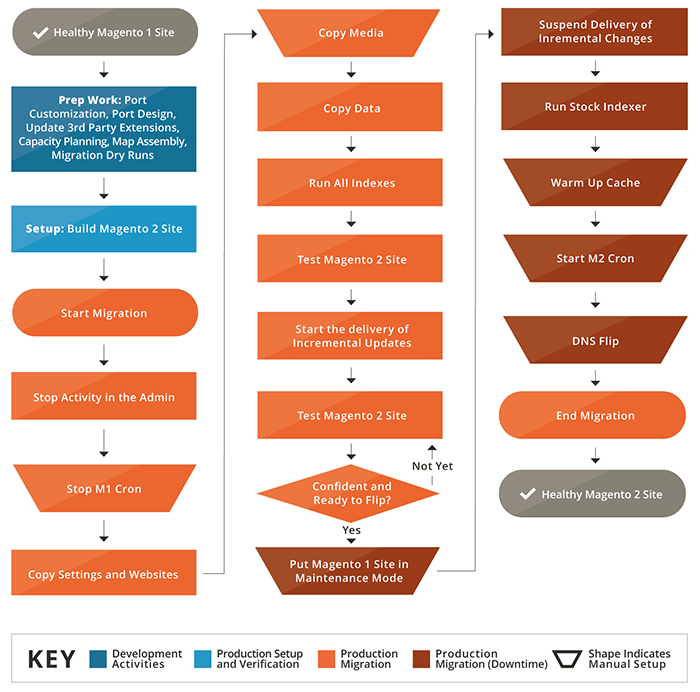 #2: When Is The Right Time to Migrate Magento 1 to Magento 2? If you’ve made up your mind to migrate Magento 1 to Magento 2 to employ its off-the-shelf features, then it will definitely a big change and also a big challenge. Now, when to make a move is the sequent concern. The answer varies, which depends on your Magento 1 situation, your strategic objectives, as well as on your budget. 1. Time to learn – around 1 week or less. For the time being, if your Magento 1 still works fine, there is no need to rush. Keep making money from your lovely store. At the same time, start learning all about Magento 2 to carefully prepare for the significant change. On the other hand, if you are daunting with Magento 1 features, make a move quickly. However, you need to also explore all about Magento 2 first to know exactly what to expect after Magento 1 to Magento 2 migration. Since you have already had hands-on experience with Magento 1. Things become much more comfortable with Magento 2. Not to mention, we have gathered all reliable resources at your fingertips. Magento 1 to Magento 2 migration tightly involves data, extensions, themes, and customizations. Take every factor into account. Decide what database needed migrating to the new Magento 2 stores: Products, Customers, Orders, Categories, CMS Page, etc. Regarding Magento theme, you should think over about whether to make use of the readily-made Magento 2 theme or build your own. When it comes to extensions, you should check which functions are already available in Magento 2. Then, you can decide which to purchase to avoid conflict and reduce time to migrate Magento 1 to Magento 2. For essential Magento 1 extensions, find the similar Magento 2 versions. About customization, you need to either rewrite or migrate Magento 1 to Magento 2 custom code. The code migration tool can be helpful to do this task. The more careful plan you make, the more easily and quickly to put it into action. Hence, we strongly recommend hiring the helping hand from certified Magento 2 developers. After tailoring a detailed Magento update plan, it is time to move. One more time, the total time usually varies much based on your plan and Magento 1 to Magento 2 migration service you hire. As seen above, migrating Magento 1 to Magento 2 is never painless. There are lots of tasks to do. Hence, whether you have a decent command of technology, you should employ developers. With such a large Magento project, web development agency is the better choice. First, have a quick look at the Magento upgrade steps to move from Magento 1 to Magento 2. Secondly, we will go insight into 5 phases for detailed action. P/S: Estimated time is referred to hiring a web agency. Build fresh Magento 2 theme from the ground up: 2 or 3 months for raising ideas, discussing with designers, and writing frontend code. Please note that Magento 1 extensions and themes are unable to You have your plan, then you will know which Magento 2 extensions to install. Spend 1 or 2 days to search and compare Magento 2 extensions first. 2 days more to install and configure all required extensions. Take 2 or 3 days extra to detect and resolve conflicts if any. To sum up, it might take up to 1 week to migrate extensions from Magento 1 to Magento 2. One of the most challenge tasks when it comes to migrating Magento 1 to Magento 2. The common types of data to transfer are Products, Customers, Orders, Categories, CMS Page, etc. Now that, Magento provides you a quick Data Migration Tools. However, Magento 1 to Magento 2 data transaction is quite complicated. To avoid an issue such as “Magento not working after migration” With the helping hand from the professional agency, only 1 week to complete the task without worrying about data loss. Code Migration Toolkit from Magento will help. The code migration might require 1 week. Nevertheless, not all of Magento 1 custom code is compatible with Magento 2 versions. Even worse, developers will have to rewrite code from scratch. That time, the process can last 2 weeks or more. It will be time to extra configure such as system environment settings, general configurations, shipping and payment method integration, SEO optimization, etc. Running a complete test through every function to make sure that your Magento 2 sites perform smoothly. Such the implementation will take from about 1 week to 2 months. with the helping hand from a professional agency, only 1 week to complete the task without worrying about data loss. #3: How Much Does It Cost To Migrate Magento 1 to Magento 2? Big change is never cheap however, it turns out your Magento 2 stores will become up-to-date and more profitable. So it is definitely worth. So, “how much need I spend for Magento 1 to Magento 2 migration?” asked by lots of online merchants. For example, you want to migrate Magento 1 to Magento 2 within 1 or 2 months. About the theme, you plan to purchase a ready-made Magento theme along with slight customization. Regarding Magento 2 extensions, you want to install 10 modules. Besides, the data to migrate to Magento 2 include core data only, which are products, categories, orders, and customers. The cost range from $1,000 to $4,000. Hiring a Magento development from Asia where labor cost is low such as Vietnam, India, Singapore will save you half or even more. Bonus to digest later: How to Hire Magento Developer? In short, migrate Magento 1 to Magento 2 means lots of things to put into your consideration. Whether you want to know more about Magento 1 upgrade plan or you are willing at all time to help you with a migration plan, feel free to contact us.